Leader of Jumhoory Party (JP), Qasim Ibrahim has made a comment during a TV interview which credits President Abdulla Yameen Abdul Gayoom’s claim the Supreme Court order on February 1 was politically influenced. In an interview to RaajjeTV on Saturday, Qasim said “they objected the order we issued on February 1.” The comment suggests his possible involvement in the order issued by Supreme Court on February 1 for the immediate release and retrial of nine politicians and immediate reinstatement of 12 lawmakers. Two Supreme Court judges; Chief Justice Abdulla Saeed and Judge Ali Hameed have been arrested for suspected involvement in a coup attempt. In his interview to RaajjeTV, Qasim said the power of the State begins with the people. He said that the government, unhappy with the Supreme Court order, “jailed three judges”. In the interview, Qasim plead his, and his family’s innocence in any attempt to overthrow the government unlawfully. He swore he did not offer bribes to any judge. Meanwhile, ruling Progressive Party of Maldives (PPM) has expressed concern television stations are airing Qasim’s interviews. At a press conference on Friday, deputy leader of PPM, Abdul Raheem Abdulla said convicts should not be allowed to give interviews to the media. He also said the Supreme Court order on February 1 was politically influenced, and that those behind the order will soon come to light. 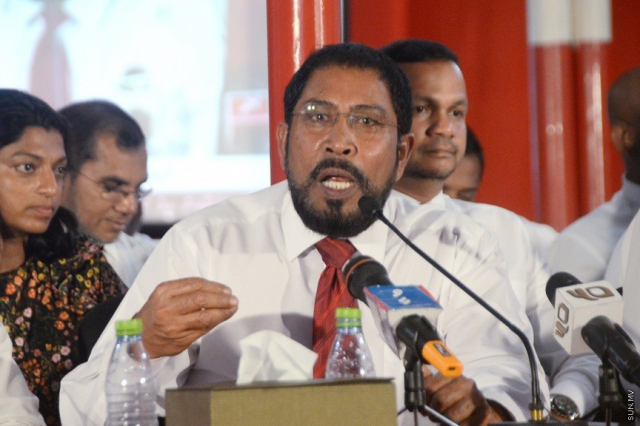 JP’s leader Qasim was sentenced to three years, two months and 12 days in prison after he was found guilty of bribery. He obtained asylum from Germany after he was allowed to travel to Singapore for medical care in 2017.